In many applications of autonomous mobile robots the following problem is encountered. Two maps of the same environment are available, one a prior map and the other a sensor map built by the robot. To benefit from all available information in both maps, the robot must find the correct alignment between the two maps. There exist many approaches to address this challenge, however, most of the previous methods rely on assumptions such as similar modalities of the maps, same scale, or existence of an initial guess for the alignment. In this work we propose a decomposition-based method for 2D spatial map alignment which does not rely on those assumptions. Our proposed method is validated and compared with other approaches, including generic data association approaches and map alignment algorithms. 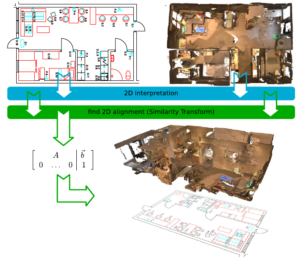 Real world examples of four different environments with thirty six sensor maps and four layout maps are used for this analysis. The maps, along with an implementation of the method, are made publicly available online.